Jaap Kroon from The Netherlands, made a Red version of his Land Rover Defender 90. 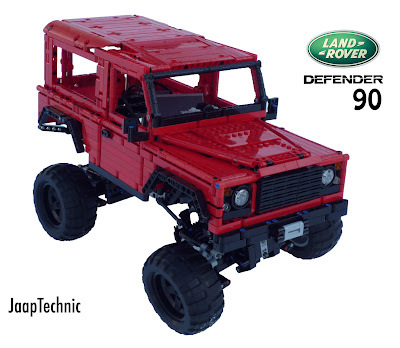 The original version was the 2nd most supported in the innititial phase of the LEGO Technic 2012 Competition. Unfortunately didn't made into the second phase, likely because it clearly violated one of the competition rules, which stated that IPs wouldn't be allowed. The red version has some differences to the original, namely in the suspension. Also it uses PF XL-motors, instead of the L-motors in the original. You can observe how it performs against the elements, in the nice video below. Find more from Jaap at his own blog, JaapTechnic and also at Rebrickable.